Food should not only taste good, it should look appetizing, too. But that is easier said than done when it comes to roasted “fleur de sel” crickets – they simply look too unfamiliar. What makes it even worse is that the insects look exactly like they do when seen hopping around the countryside; people in Europe are not used to finding them on their plates rather than in the grass. But this is nothing more than an initial obstacle. Anyone who has actually tasted the crickets can only agree with Josef Hirte and Mathias Rasch: the salt is the perfect accompaniment to the slightly nutty taste of the insects. The two entrepreneurs, a physicist and a teacher, specialize in ready-to-eat crickets. Recently they set up “Wicked Cricket”, an online mail order service for people who like to snack on crickets. 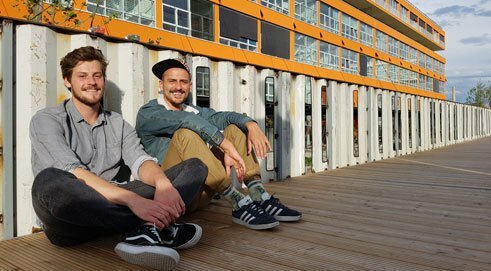 Wicked Cricket founders Josef Hirte and Mathias Rasch | © Teresa Hirte The start-up is not based in Asia, that is to say where most people in Europe would expect to encounter the practice of entomophagy – the eating of insects. In fact, it is sparking a small culinary revolution from its base in Munich: encouraging people to view insects as a culinary enrichment. After all, the 1,900 edible species of insects have plenty of benefits to offer, including for the taste buds. What is more, they are an extremely nutritious staple – and one that can be eaten with a clear conscience. Especially by those who want to help save our planet by changing their eating habits. Consider for instance the fact that 25 kilos of animal feed are needed to produce one kilo of beef. By contrast, only two kilos of feed are needed for a kilo of crickets, not to mention only eight percent of the land that is required for cattle breeding. And the little creepy-crawlies are healthy into the bargain. Crickets contain a lot of vitamin B12, all nine essential amino acids and loads of important micronutrients. These are all excellent arguments which, according to a survey conducted by market research institute TNS Infratest, do convince no fewer than 80 percent of Germans that insects are a food that they could theoretically imagine eating. In practice, however, they are still very much a niche product. Partly because they are not – as yet – to be found on supermarket shelves as a matter of course, but need to be ordered online. From wuestengarnele.de, for example, where lemon- or raspberry-flavoured “insect lollies” that contain a mealworm can be purchased. Or “Rigate” insect pasta made from whole ground buffalo worms. Soon there will also be protein bars that combine dates and crickets in a way that fitness enthusiasts will find extremely invigorating. Timo Bäcker and Christopher Zeppenfeld came up with the idea for this power snack when they tried crickets and fried caterpillars for themselves while touring Asia. They quickly realized that people in Germany might find the snacks somewhat unappealing because of the way they look. So they teamed up with sports scientist Daniela Falkner to create a neutral-looking snack bar that they could market – one that would provide athletes with the insect proteins that are so ideally suited to their needs. Currently they are in the process of crowdfunding their “Swarm” bar, which is made out of ground crickets and comes in the flavours Red Berries, Chia Hazelnut and Raw Cacao. They already have some high-profile support, for example from the Federal Ministry for Economic Affairs and Energy and from the European Social Fund in Germany. After all, there is also considerable political interest in persuading Germans to overcome their reluctance to try this as yet unfamiliar food. There are still some hurdles to surmount, but as the two “Wicked Cricket” founders explain, “inhibitions are reduced through information!”. “If we can communicate the many benefits of entomophagy to potential customers, and if we talk about our distaste as being a cultural phenomenon, we will be able to convince many people.” Especially since there is definitely some tradition of insect eating in Germany. An 1844 German magazine for state pharmacology for example described “cockchafer soup” as an “admirable and substantial foodstuff”. In the nineteenth century, the poet and illustrator Wilhelm Busch also incorporated this insect, which was still extremely widespread at the time, into his works – and into his own cooking. In his memoirs, he writes that guests even asked for seconds, especially when unaware what the soup was made out of: namely around 30 cockchafers per head, fried without wings and legs in butter and then cooked in broth. In his day, the beetles could also be purchased individually – coated in sugar and candied from pastry shops. It was recommended at the time that one should pay attention to what the cockchafers had eaten. A taste of what people may soon be eating can be found in Switzerland, where a supermarket chain has just started selling insect burgers made of mealworms. And there are plans to rapidly extend the range of creepy-crawlies. Consumers in Germany won’t have long to wait, either. As yet, insects can only be sold as food if they are also recognizable as such. However, exceptions are already possible, and from 2018 the European Union’s revised Novel Food Regulation comes into effect. This will set out uniform standards for things like cultivation and feed quality, and the insect menu plan can be significantly extended. Timo Bäcker and Christopher Zeppenfeld, the founders of SWARM Protein, with one of their farmers in Thailand | © Tim Hartmann As yet, Josef Hirte and Mathias Rasch still source their crickets from a Dutch farm in – certified – organic quality. “We would like to use a regional supplier, but so far there is not a single farm in Germany”, they lament. Obviously this could change if demand increases. Perhaps more people will get a taste for insects thanks to the “Wicked Cricket” Christmas special: roasted crickets with sugar and cinnamon. Constanze Kleis is a journalist and book author.